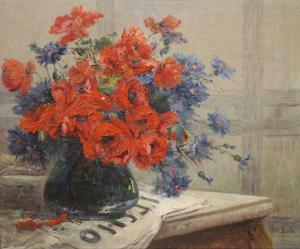 Find artworks, auction results, sale prices and pictures of Marie Martin at auctions worldwide. 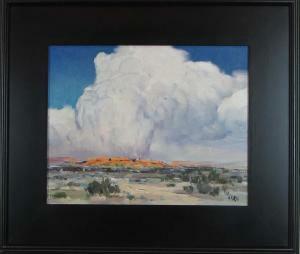 Description: MARIE MARTIN (Oregon/California, born 1940) oil on canvas, "Thunder in the Dusk," desert landscape with large cumulus clouds. Signed lower right, titled verso. Image measures 16" x 20. In a wood frame; 25.5" x 29.5" overall. Marie Martin - Eucalyptus In The Sky. Description: MARIE MARTIN (Oregon/California, born 1940) oil on canvas, "Eucalyptus in the Sky." Signed lower right, signed again and titled verso. 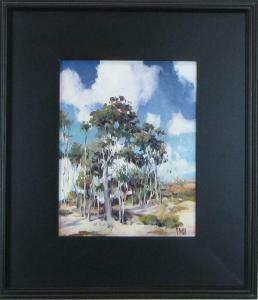 Image measures 14" x 11". In a wood frame; 23.5" x 20.5" overall. 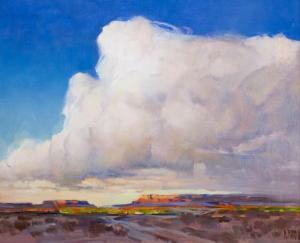 Description: MARIE MARTIN (Oregon/California, born 1940) oil on canvas, "West of Santa Fe," desert landscape with clouds. Signed lower right, signed again and titled verso. Image measures 16" x 20". In a wood frame; 25.5" x 29.5" overall. 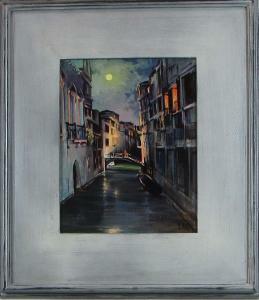 Description: MARIE MARTIN (Oregon/California, born 1940) oil on canvas, "Venice Lights." Signed lower right, signed again and titled verso. Image measures 14" x 11". In a wood frame; 23.5" x 20.5" overall.